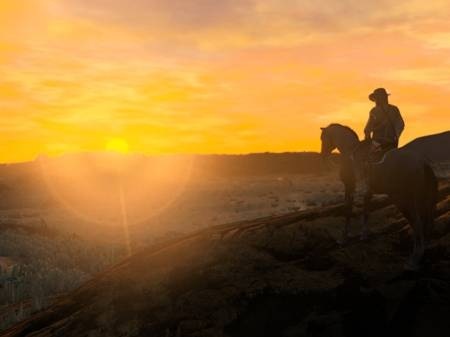 The sunset peeking over the hills of Mexico in Red Dead Redemption. To get me through this long cold Northwestern winter, I put together a list of a few songs that call to mind a warm campfire on summer night. Fingerpicked on acoustic guitar primarily, these songs run the gamut from the plaintive desperation of Elliot Smith, famed Portland musician, to classic acoustic country-tinged contemporary guitarists like Iron & Wine and Josh Ritter and gravel-toned rocker Eddie Vedder. The playlist kicks off with an absolute gem from Jose Gonzalez, which I associate with the Western classic video game Red Dead Redemption. Imagine riding your horse into Mexico for the first time, an unknown in a foreign country, the sun setting over the rolling hills and windswept deserts, and this song springs into your ears. It is an unforgettable moment in a classic game, and rightfully sets the tone for the finger-picked brilliance that follows. Let the warm-glow of the imaginary campfire wash over you, and enjoy!